Ancients grains. Once upon a time, on the very land that you live on today, when traffic was non-existent and the trees flourished, it was an era when people depended on natural, truly organic foods to sustain them for the day. Eating healthy was not something that they thought of doing, they just did, everyday, unknowingly and quietly. This is a tale of grains and their ancient wisdom that once echoed with the people of yesteryears and how they are slowly, yet steadily finding their way into back into millennial lives. Once a staple breakfast dish, ragi was consumed daily, back in the day in various avatars - ragi malts, ragi dosas, as well as ragi dough. It's a gluten-free grain, that's loaded with calcium and is also believed to have anti-ageing elements. A delicious way to keep fit and young! Our delicious ragi banana cake! If it was good enough for the Aztecs, it is definitely good enough for us. It was once considered to be sacred by them, so much so that they would make the grain a part of entire religious ceremonies. Amaranth is a good source of protein and minerals and its a blessing in disguise for people with high cholesterol. According to recent studies, phytosterol, which is found in the grain is believed to have cholesterol-reducing properties. Amaranth, technically isn't a grain, it's actually the seed of the Amaranth plant! Dive into a healthy bowl of Amaranth 'n' Cottage Cheese Tabbouleh! The most popular ancient grain at the moment, that quite literally has taken the world by storm! Quinoa, a simple grain that is a nutritious powerhouse. Quinoa happens to be one of the few ancient grains that house all the nine essential amino acids. Its safe to say that quinoa is highly...highly nutritious and it's no wonder that people all over are slowly turning out to be big fans of quinoa! 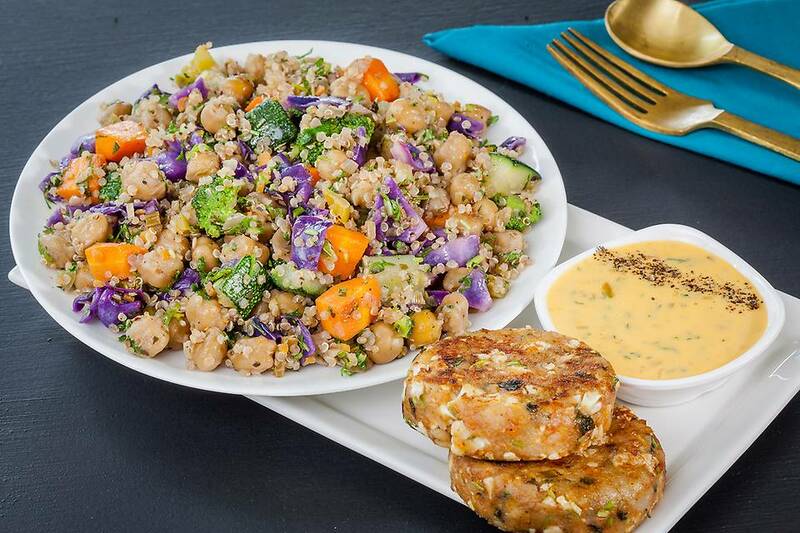 Feast on this Quinoa Cutlet 'N' Chickpea Salad Meal! Eat right, stay healthy, and try something new everyday only on FreshMenu.com!